Phenotypically similar to Okavango cattle, but generally small and well proportioned body size; horns are long, massive, lyre-shaped and circular in cross-section; cervico-thoracic hump and moderately long neck; heavy and folded dewlap; coat colour is commonly light or dark dun, slightly darker on the head and over the shoulders and withers. Maintained by the Ovambo tribe in northern Namibia and south-west of Angola. 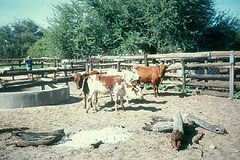 Sanga cattle were introduced into southern Africa when the Khoikhoi (Hottentots) first crossed the Zambezi river about 700AD with their Sanga cattle. Several waves of the Bantu people with various strains of Sanga cattle entered the region and settled. 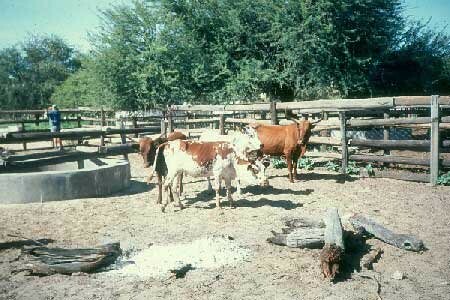 Ovambo cattle are believed to have originated from the Sanga of Angola, following loss of the original cattle holdings through raids by the Khoikhoi during the middle of the 19th century. The Ovambo are related to other Sanga breeds in Namibia, namely the Kaokoveld, Okavango and Caprivi.